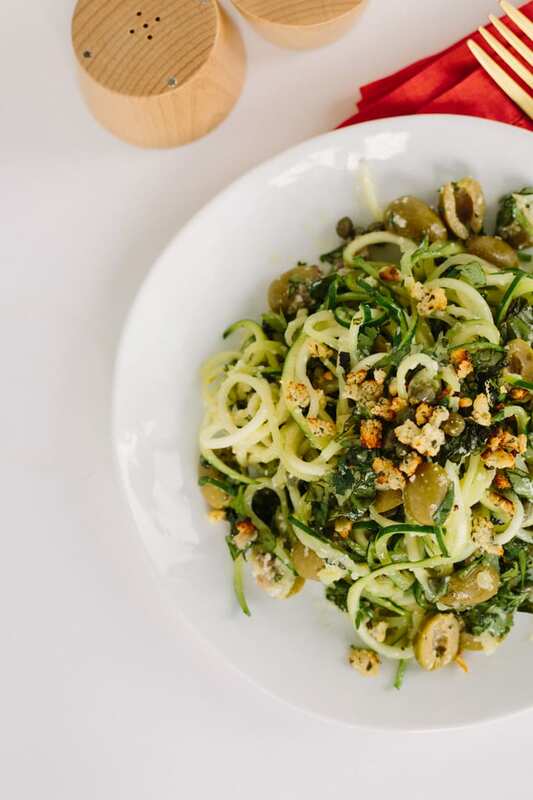 As I plan what I’m going to post on this blog the week before my wedding and the week of my honeymoon, I figured: why not inspiralize existing recipes? So, I turned to my favorite cooking sites, like BonAppetit.com, FoodandWine.com and of course, MarthaStewart.com and looked for pasta recipes that needed a little healthy makeover. Voila: this recipe from Bon Appetit made me want to lick my monitor, it was that delicious-looking. I do this a lot when I’m lacking the proper inspiration – I turn to the “pros” and see what they’re whipping up, and I try to put an Inspiralized spin on it. With this recipe, it worked fabulously. Zucchini noodles were substituted for regular pasta and homemade gluten-free breadcrumbs were substitued for panko. 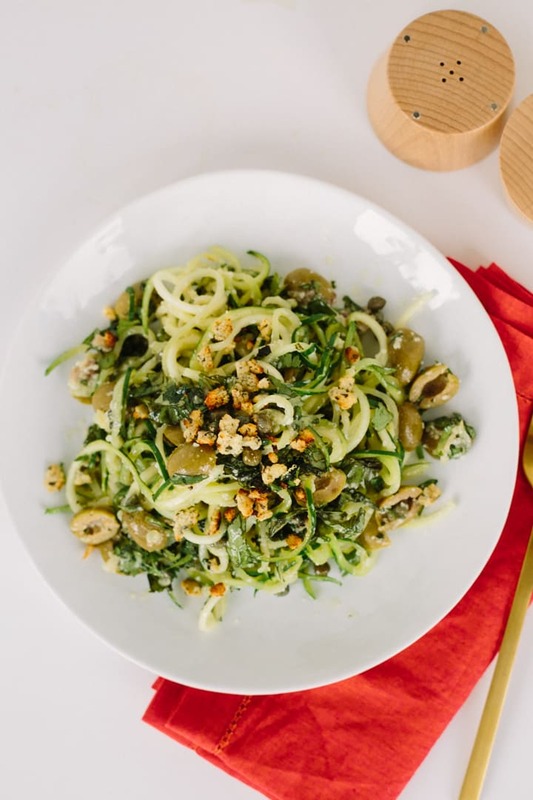 The zucchini absorbs the creaminess of the sauce as it combines with the parmesan cheese. The zesty-ness of the breadcrumbs adds a tangy zing to every bite and offers that crunchy texture without the gluten. If you make the breadcrumbs, triple or quadruple the amount and save the leftovers for future spiralized meals, like this one. 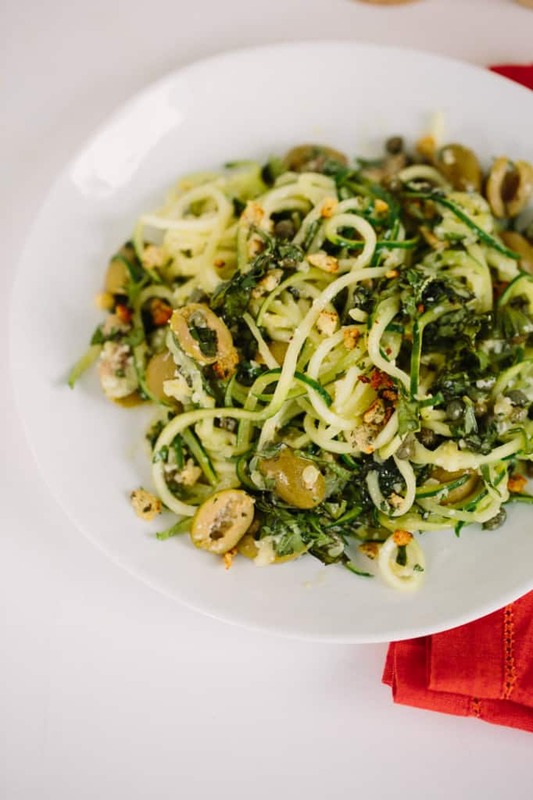 Now, if you’re afraid of anchovies, let this be the recipe that changes your opinion – it adds such a robust, outstanding flavor and this dish wouldn’t be the same without them! I have to admit, though, whenever I cook with anchovies, I always make a “ick” face. It’s hard not too – they’re so squirmy! The saltiness is what really drives this dish home. It’s colorful, it’s got a great kick and of course, it’s healthy. So, thank you Bon Appetit, for giving me the inspiration for today’s recipe – you’re taking a lot of the guesswork out of the blog, during my last two weeks of wedding planning! What are some of your favorite recipes you’d like to see me Inspiralize? In a small bowl, combine all of the ingredients but the water and zest for the breadcrumbs and whisk together. Add in the water and use your hands to form a dough – it should end up in a ball. Place a small skillet over medium-high heat and once heated, crumble the dough ball into the heated skillet and continually break up with a wooden spoon. Cook for 5 minutes or until breadcrumbs break up, harden and become “toasted.” Set aside in a bowl and stir in lemon zest. Mash the anchovies and garlic to a paste on a cutting board (use a knife or pestle.) Add the paste to a large bowl along with the parsley, basil, and half of the olives and capers in a large bowl. Chop remaining olives and capers and add to the bowl, along with oil. Mix well; season sauce with salt and pepper. Place a large skillet over medium-high heat and once heated, add in the zucchini noodles. Toss for 3-5 minutes or until cooked to your preference. Add the zucchini pasta to the sauce. Season with pepper. Toss, adding parmesan a bit at a time, until sauce coats pasta. 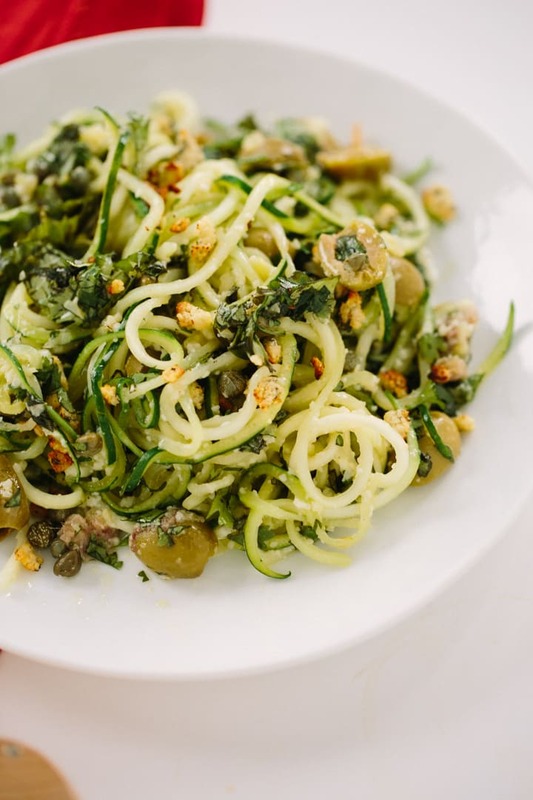 Serve zucchini pasta topped with the prepared breadcrumbs. Definitely an 'ick factor' with anchovies......my solution would be to use anchovy paste instead! Do you think that might work? Anchovy paste would substitute beautifully. It's great to keep on hand, especially if you just need a couple of filets and don't want to open a whole can. I don't suffer the "ick" reaction from anchovies, but I do like the convenience of the paste! Can't wait to make this recipe! BTW: Ali - I agree that you definitely qualify as a pro! In same ick factor with anchovies, but making effort to branch out. Has anyone attempted it with anchovy paste yet? If so, how was it, and how much paste did you use? Oh my goodness yum! This looks fabulous! My husband is allergic to seafood and shellfish. Any recommendations on what to add in place of the anchovies? Thanks. It does look good, but it took me several readings before I could see the "breadcrumbs" ingredients were in the lower part of the recipe ingredient list. I was trying to imagine how I would get breadcrumbs from olive oil anchovies, etc. The breadcrumb instructions coming first added to the confusion. For clarity the "for the bread crumbs" should be separated or highlighted. I know this sounds kind of picky, but so many comments on recipes are related to confusion. Can't rate it yet but I will after I make it! I tried the recipe last night. I used the anchovies even though I hate them, because you said that they are really necessary. I still hate them after trying the recipe. I will again make it without the anchovies. 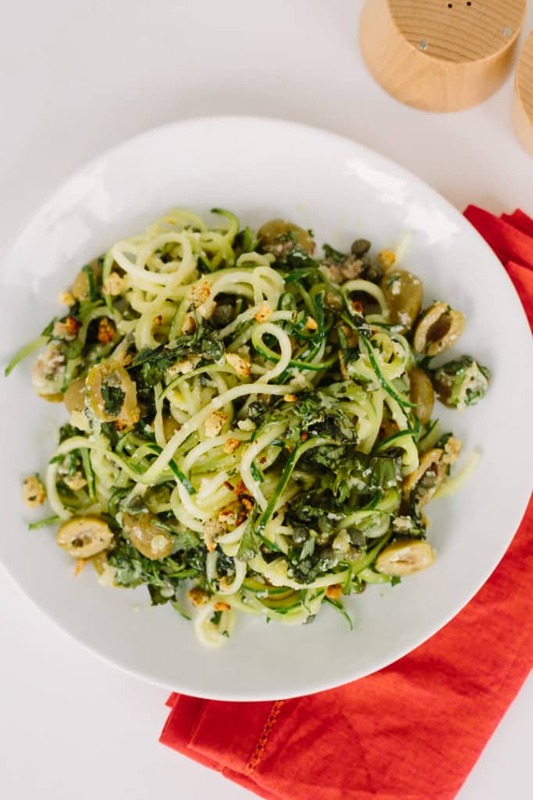 Also, as I am dabbling somewhat in a fully raw diet, I did not sauté the zucchini noodles and I still found it delicious. I also topped with chopped raw almonds mixed with the same spices.